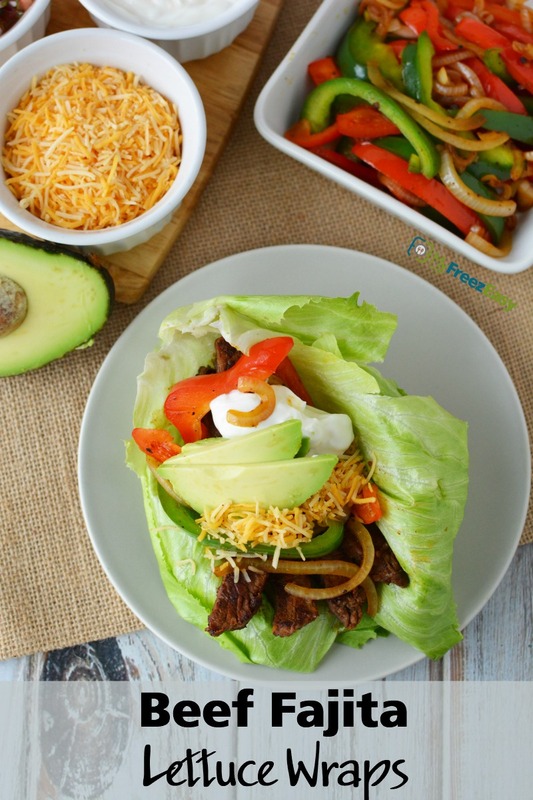 Low-carb and grain-free fajitas! If preferred, use homemade taco seasoning (search for best recipe on 5DollarDinners.com.) And if you are eating keto, add an extra helping for avocado (yay for good fats!) Enjoy! Place the beef in a shallow dish and squeeze the juice from the limes over the beef and then season both sides with the chili powder, ground cumin and garlic powder. *Let marinate for at least an hour, ideally overnight. Slice and toss together bell peppers and onion. In a large skillet, saute the flank steak with the marinade over medium high heat, flipping often, until cooked to your liking - about 6 to 8 minutes. Cooking time may vary depending on heat over the grill and thickness of the beef. Remove the flank steak from the skillet and then saute the veggies for 3 to 5 minutes, or until softened. Slice the flank steak across the grain into strips for your fajitas. Add sliced beef, grilled peppers and onions, and toppings to the lettuce leaves. 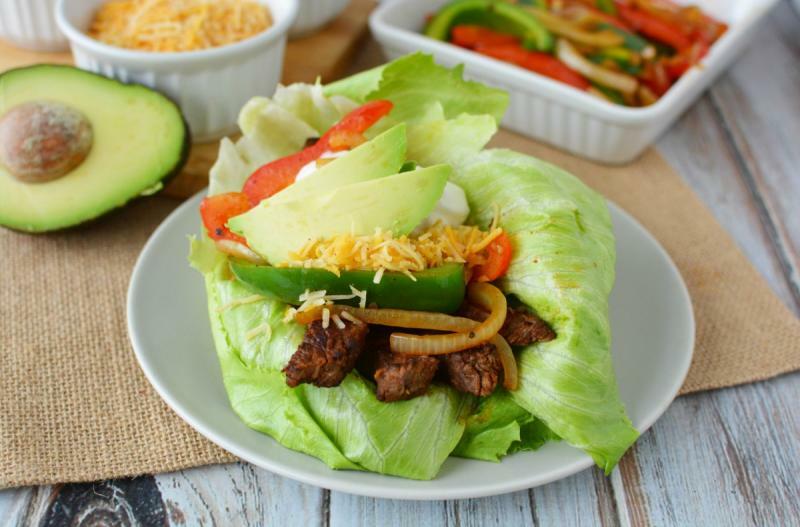 Serve Beef Fajita Lettuce Wraps with desired toppings. Slice 2 white onions, 2 green and 2 red bell peppers. Mix together and then evenly divide into 2 quart size freezer baggies. Put baggie in the freezer and freeze up to 6 months in fridge freezer or 12 months in a deep freezer. Remove the veggie pack from the baggie and thaw in the fridge. Thaw the flank steak in the fridge completely before sauteing with veggies, as directed. Slice and serve in lettuce wraps. Recipe is dairy-free when you omit sour cream or cheese toppings. Thaw veggies in fridge. Thaw beef completely before sauteing. Grill veggies in skillet after the flank steak is cooked to your liking. Once cooked, assembly fajitas in lettuce wraps and add desired toppings. Serve with sour cream, shredded cheese and guacamole.